There is a saying that luck is the intersection of where opportunity meets preparation. And if an opportunity presents itself that could further your business, you want to be ready. To do that, you need a pristine, fully-functional pipeline. You need processes in place that will allow your business to source, nurture and close sales on a consistent basis. Building a pipeline is a critical step for businesses in both the public and private sectors. As a small business, you need to be able to pursue opportunities that are a good fit for your business. These are projects you are qualified and licensed (if necessary) to do. Not only that, but you want to make sure you have the capital, human resources and time you need to deliver on projects. That takes planning and strategy. Planning and strategy are what this session will help you to develop and implement. Is a clogged pipeline costing you money? If you never took the time to map out a strategy for how you will source and nurture, and convert those leads into happy customers, there's a good chance you are leaving money on the table. Map a growth plan that will help you to scale your business over the next, three, five and seven years. 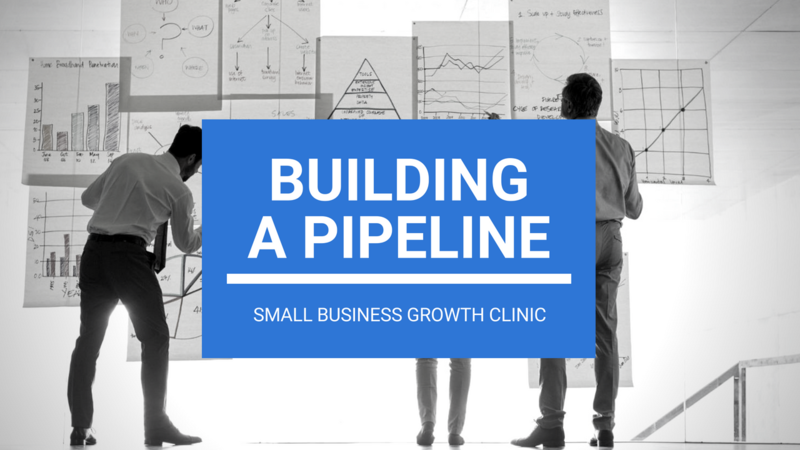 Keep an eye on your inbox to find out when the next Building a Pipeline Clinic will be.